ORLANDO, FLORIDA - Delanie Walker held the ball in the end zone and waited for his teammates to celebrate. 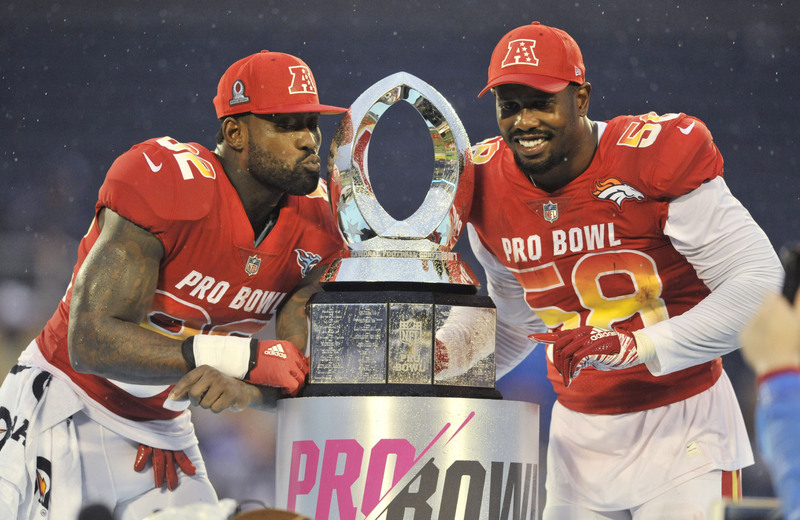 The Tennessee Titans tight end caught two touchdown passes, including an 18-yarder with 1:31 remaining, and the AFC beat the NFC 24-23 in a rain-soaked Pro Bowl on Sunday. Teammates mobbed him. Pittsburgh receiver Antonio Brown, Baltimore safety Eric Weddle, Jacksonville cornerback Jalen Ramsey and Steelers coach Mike Tomlin were among those who left the sideline to congratulate Walker. The winning team got $64,000 each, double the losing team’s share. “You’ve got guys on the sidelines saying, ‘I need that money,’ ” Carr said. Carr completed 11 of 15 passes for 115 yards and connected with Walker on a skinny post for the winning score. 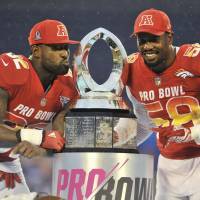 Denver’s Von Miller sealed the victory when he caused and recovered a fumble by Los Angeles Rams quarterback Jared Goff. Miller posed problems all afternoon for the NFC. “I go all out all the time,” Miller said. Although the game was more two-hand touch than hard-nosed football, there were plenty of defensive gems. Arizona’s Patrick Peterson had two interceptions. Minnesota’s Harrison Smith returned a pick for a score. And two players took exception to one aggressive takedown. Tennessee left tackle Taylor Lewan and Oakland guard Kelechi Osemele had words for New Orleans defensive end Cameron Jordan after he drilled Indianapolis tight end Jack Doyle. None of those plays compared to Miller’s game-clinching strip-sack. The AFC overcame a 17-point halftime deficit and four turnovers to win the annual all-star game. Heavy downpours were partly to blame for the sloppiness. The rain prompted some fans to leave Camping World Stadium and others to break out ponchos. It also caused players on both sidelines to scramble to protect cellphones. Jordan, New Orleans running back Mark Ingram and others had their phones in hand during introductions, and dozens more could be seen using them on the sidelines early in the game. They shoved them in plastic bags as the rain started. Walker was voted the offensive MVP, and Miller was the defensive MVP. Both got luxury cars to go along with trophies.